KwikStairs will do just that. KwikStairs have designed a flat pack wooden staircase that uses a carefully designed template to make it possible for the user to build any staircase to fit any situation directly on site. 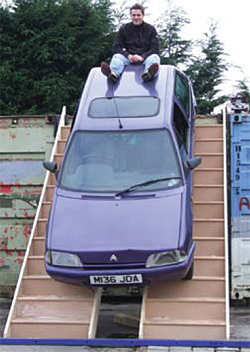 You do not need to place an order weeks in advance for your stairs, you can purchase them directly off the shelf the same day as you need them. They are very cost effective so no need to waste time in contacting lots of companies for quotations. You buy a straight flight and add any winders as needed. You measure your own floor to floor measurement and work off of a carefully produced system that will tell you what requirements are needed and therefore what template you need to follow. You can purchase your stairs now by ‘clicking on’ products and follow the suitable links or visit any good builders merchants with the knowledge of your floor to floor measurement ,where and what stairs you need and walk out with your flat packed kits. You take your staircase to the site and using the template supplied with all of the prepared components you assemble your staircase. A straight flight has been assembled and fitted in less than two hours!!! You then fit your staircase into your opening. Your stairs are ready to use.